Climbing plants add colour to trees by growing through them, or can be used for ground cover for dry banks. Two climbing plants will happily grow through each other to extend the flowering period, or one to provide foliage for the winter. On sunny sheltered walls, plants needing some protection may be grown. Most will need some help through the use of trellis or a network of wires which are available in our Garden Shop. Self clinging plants will adhere to a wall once established and will do no damage to sound brickwork. Climbing plants may be used to great advantage in every garden; for covering walls of houses or out-buildings, to cover poles and pergolas, low walls, fences and dead tree stumps. 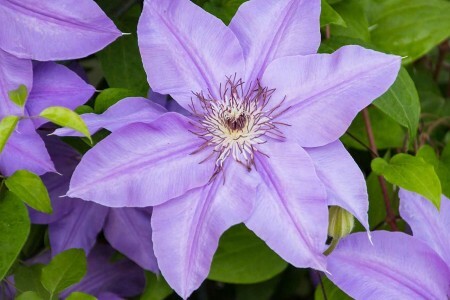 Some of the most popular flowering climbers are Clematis which are perfect to cover walls, trellis or pergolas with a mass of blooms from Spring until Autumn. The early Summer flowering types may have a second flowering in Autumn. Late flowering Viticella types may be grown through early flowering shrubs (especially Ceanothus) to give a longer season of colour. They grow best in good loamy soil with well-rotted manure and their heads in the sun and roots in the shade. Clematis are heavy feeders and benefit from an annual mulch and watering in dry weather. Many may be grown in containers.